Morelia/Linares 2008. Topalov takes a solo lead with 2,5 out of 3! Morelia/Linares 2008. Ivanchuk defeated Leko! Anand lost to Aronian! Timofeev and Muzychuk wins Moscow Open 2008. Weekly Study #4 "Rook endings"
Today's topic is "A Rook vs Three Pawns". Now we are finishing with the chapter "Rook with pawns". In the endings three pawns it is enough compensation for the rook as a rule. The result depends on location of pieces, pawn's structure and how pawns has advanced. The further pawns are the more dangerous they are. For the successful fight against three pawns one needs full coordination of king with the rook, otherwise pawns may win. Anand recovered and beated Carlsen with Black. Topalov grabbed the sole lead by beating Ivanchuk with White. Aronian-Radjabov and Leko-Shirov ended in a draw. The Bulgarian is leading with 2.5 points out of 3, the world champion has half a point less. Together they scored 4 wins so far. No one else has a plus score after the first three rounds. Morelia-Linares is just two rounds ahead, but so much has happened already. Two decisive games today: Aronian defeated Anand with Black in a Marshall and Ivanchuk beat Leko in a rare line of the Ruy Lopez. Topalov and Radjabov seemed to be blundering a pawn one after another, and then drew their Berlin Wall, Shirov-Carlsen in a solid Paulsen drew their game. 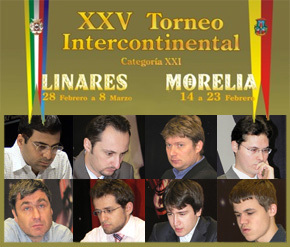 Morelia/Linares is an eight-player, double round-robin and is held from February 14 till March 8. Participants are Anand, Aronian, Carlsen, Ivanchuk, Leko, Radjabov, Shirov and Topalov. The first part takes place 14-23 February in the Mexican city of Morelia, after which the players fly to Spain for the second part of the tournament: February 28 - March 8 in Linares. We continue with the rook's endings. Today's theme is "Rook vs Two Pawns". Of course the rook again has very good chances to win. Some of the technical approaches used in this study are the same we have seen in the previous one. However, there are also many new posibilities. not only was I worried, but also my opponent." Video "Game Tal vs Fischer" The great Mikhail Tal, "the Magician from Riga", was one of the greatest attacking geniuses in the history of recorded chess. His attacking style consisted of beautiful displays of multiple, cascading fireworks, where the true nature of the positions during the execution of his combinations was unfathomable by his opponents, even Tal himself!, in the scant time limit imposed in human over the board chess games. Unlike the smooth, almost effortless style of a Capablanca, Tal purposely played moves that created the maximum complications for both sides. He once said, "One doesn't have to play well. One only needs to play better than his opponent". Dr. Lasker would have loved that quote, for he too believed the game of chess as a struggle between two minds, as opposed to each player blindly making "correct" moves. Artyom Timofeev has won this year’s Moscow Open, after a marathon last-round game against the leader Ernesto Inarkiev, who had just won 7 games in a row. Anna Muzychuk won the ladies tournament. Timofeev became clear first with 7.5 out of 9, before Alexander Riazantsev and Sergey Volkov. Anna Muzychuk (Slovenia) won the ladies tournament with 8 out of 9, after a quick last-round draw against Harika Dronavalli (India). And so the tournament was won by two quite young players. 23-year old Artyom Timofeev, the current #51 in the world. The succes was even more special for Anna Muzychuk, who at only 17 years old is becoming a very strong player very fast. She was born in Ukraine but is now representing Slovenia. She’s third in the world in the girls under 20 list, behind Hou Yifan and Katarina Lahno. The best Israeli player was GM Max Rodshtein. He has finished on 21 place with 6,5 points. How often did you meet in your practice Rook endings? I claim that more than half of all games pass through this part! So for improving your chess skills you'd study rook endings extremely carefully. The rook is a powerful long-range piece and should generally be used actively. It is not adept in passive defence and the blockade of enemy passed pawns. For this reason the game may still be unclear even when one side has sacrifice his rook! Start from the first Rook vs Pawns. 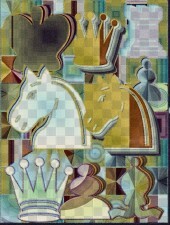 Type 1: The king stops the passed pawn, while the bishop protects the other pawns. 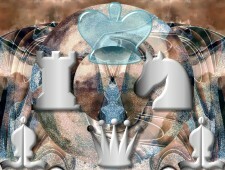 Type 2: The bishop stops the passed pawns while the king assists it and stops the atacking king breaking through. 3) If a fortress of the second type can be broken, then the attacker usually creates two passed pawns on different wings and his king helps one pawn to advance, eventually winning the bishop. 4) If the attacker sacrifices material himself to create passed pawns, his bishop must be able to halt the resulting enemy passed pawns on diagonal. The principle of one diagonal is important for the attacker and the defender as a methode to avoid falling into zugzwang or being diverted. 5) As defender, attack your opponent's pawns with your bishop to force them onto squares of the opposite colour to your bishop. It is then easier to create a safe blockade. These are two interesting games I've played recently. The first game was in very agressive line, known as "poison pawn" in Naidorf variant against IM Alexikov, the second was positional game, which I've played today against Zalkin D in "Paulsen" line.